Product prices and availability are accurate as of 2019-04-17 18:05:43 UTC and are subject to change. Any price and availability information displayed on http://www.amazon.com/ at the time of purchase will apply to the purchase of this product. Getting kids to be active is a chief concern of parents, along with educating them through play. 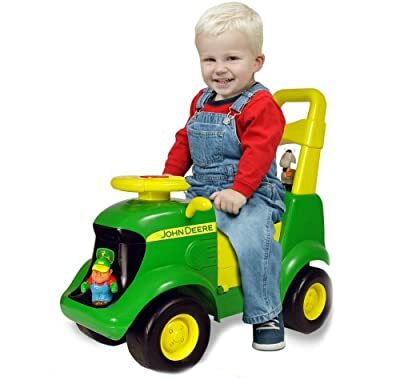 The John Deere Sit-N-Scoot Activity Tractor works on both by teaching kids about farms at the same time as getting them on their feet and scooting! Is The Sit-N-Scoot Activity Tractor Worth Buying? 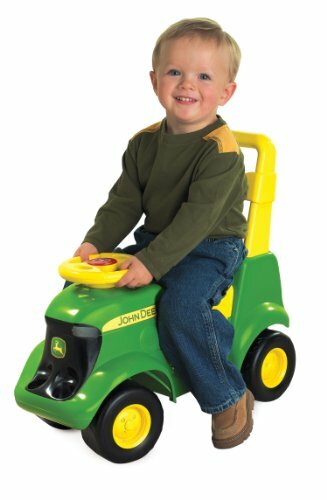 The first thing the Sit-N-Scoot activity tractor gets right is assembly. Although this is a large toy meant for riding around on and pushing along, there’s basically nothing to assemble here. All you have to do is attach the seat, which is done by sliding it onto the body of the toy – simple as that! Once up and running the colorful and chunky design will appeal to kids. It’s eye-catching, which helps to hold attention once kids are playing and also makes imaginative play a little more vivid. There are many excellent features on this tractor. First, it plays “Old McDonald”. This is a brilliant choice of song that all kids absolutely love once they learn, and it encourages them to learn the names of animals. The tractor also makes tractor sounds. 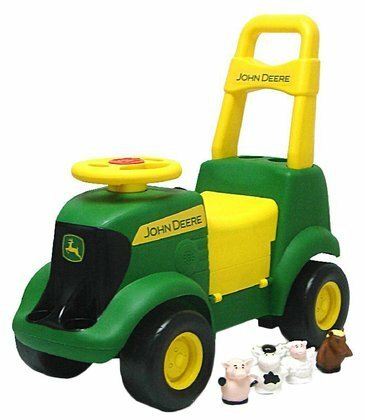 This adds to a child’s play session, helping to bring the tractor to life and giving them a better grasp of what their toy is meant to be. It’s a small thing that gives lots of extra excitement, making this more fun to play with. 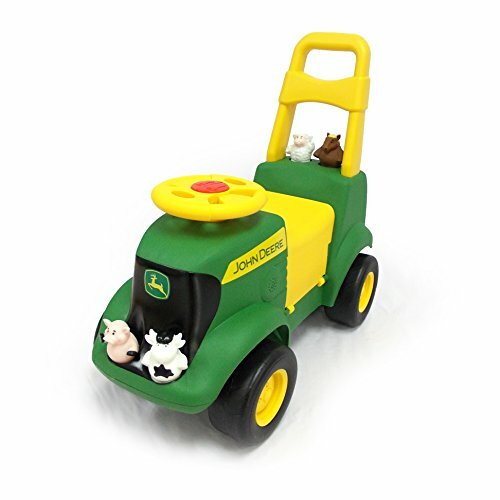 There are also four farm animals included in the set. These can ride on several different parts of the tractor. Alternatively, they can be stored inside the seat. The animals encourage further the learning of animal names, and make the give the toy a greater range of entertainment features to keep kids occupied for longer. Besides being used to store animals, the lifting seat can also be used to store other things. 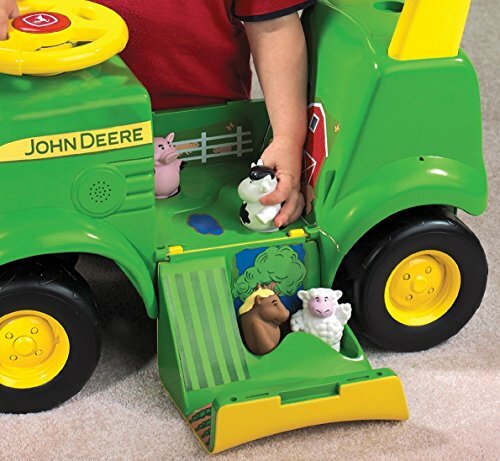 That means kids can keep their favorite toys inside the tractor if they want, taking them wherever they scoot. The seat also plays animal sounds when it’s raised which adds another dimension to an already full-featured toy. Most important of all is that this toy encourages kids to be active. It can either be ridden on, with kids using their feet to scoot themselves along, or it can be pushed along with the walk-behind bar. This makes it great for kids who are learning to walk. Overall this is a brilliant toy that’s sure to bring happiness and hours of entertainment to your child. At the same time, it’ll help to get them active and teach them a bit about farmyard animals. An all-round great package and at a reasonably price as well.